Anhuf, D., Ledru, M.-P., Behling, H., Cruz Jr., F. W. , Cordeiro, R.C., van Der Hammen, T. H., Karmann, I., Marengo, J., Pessenda, L.R., Siffedine, A, De Oliveira, Paulo E, Albuquerque, A.L., and P. Silva Dias, Paleo-environmental change in Amazonian and African rainforest. Palaeogeography-Palaeoclimatology-Palaeoecology (in press). Cruz Jr., F.W., Burns, S.J., Karmann, I., Sharp, W.D., and M. Vuille, Reconstruction of regional atmospheric circulation features during the Late Pleistocene in subtropical Brazil from oxygen isotope composition of speleothems. Earth and Planetary Science Letters, 248, 494-506. Cruz Jr., F.W., Burns, S.J., Karmann, I., Sharp, W.D., Vuille, M., Ferrari, J.A., A stalagmite record of changes in atmospheric circulation and soil processes in the Brazilian subtropics during the Late Pleistocene. Quaternary Science Reviews (in press). Cruz Jr., F.W., Burns, S.J., Karmann, I., Sharp, W.D., Vuille, M., Cardoso, A.O., Ferrari, J.A., Silva Dias, and P.L. Viana Jr., 2005a, Insolation-driven changes in atmospheric circulation over the past 116,000 years in subtropical Brazil. Nature, 434, 63-66. Cruz Jr., F.W., Karmann, I., Magdaleno, G.B., Coichev, N., and P.L. Viana Jr., 2005b, Influence of hydrological and climatic parameters on spatial-temporal variability of fluorescence intensity and DOC of karst percolation waters in the Santana Cave System, Southeastern Brazil. Journal of Hydrology, 302, 1-12. Cruz Jr., F.W., Karmann, I., Viana Jr., O., Burns, S.J., Ferraric, J.A., Vuille, M., Siald, A.N., and M.Z. 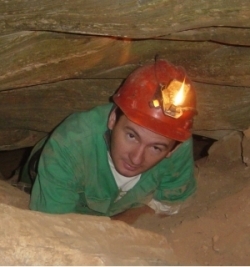 Moreira, 2005c, Stable isotope study of cave percolation waters in subtropical Brazil: Implications for paleoclimate inferences from speleothems. Chemical Geology, 220, 245-262. Kinoshita, A., Karmann, I., Cruz Jr., F.W., Graeff, C.F.O., and O. Baffa, 2005, K-band ESR spectra of calcite stalagmites from southeast and south Brazil. Applied Radiation and Isotopes, 62, 247–250. Ledru, M.-P., Rousseau, D.-D., Cruz Jr., F.W., Riccomini, C., Karmann, I., and L. Martin, 2005, Paleoclimate changes during the last 100,000 yr from a record in the Brazilian Atlantic rainforest region and interhemispheric comparison. Quaternary Research, 64(3), 444-450.